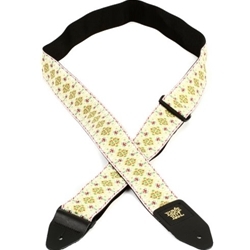 Ernie Ball has been in the music accessories business since the 1960s, and their guitar straps are some of the best selling straps out there. Pretty much all of Sweetwater guitarists have owned or own one. Made from high-quality materials, Ernie Ball straps are extremely comfortable, functional, and stylish. And if one design isn't your thing there are a ton more to choose from to personalize your guitar, your strap, and your look. You can't go wrong when you're slinging your guitar on an Ernie Ball strap!